The pupils show their certificates during a group photo with their teachers. SARIKEI: A two-day camp run by SK Sarikei serves to help develop a strong sense of discipline, self-confidence, teamwork and solidarity in pupils. The weekend programme involved 52 Primary 5 pupils, many of whom are members of various uniformed bodies like the Boys Scouts. 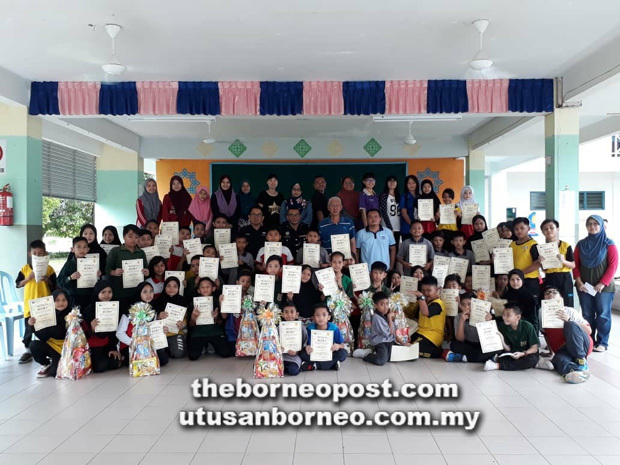 SK Sarikei headmaster Awangku Suhaili Awangku Mahmud said the programme was part of the school’s extra-curricular activities for the pupils. “We strive to inculcate positive values in the children through such activity,” he said. Every participant received certificates of attendance from Suhaili at the closing ceremony of the programme in the school’s hall last Saturday.